The process of transforming illiquid assets into liquid assets via securitization was financed via the money market. The SIVs acquired tranches of ABSs and issued short- and medium-term debt on the commercial paper market. The short-term interest rates are directly influenced by monetary policy, and the continued increase in short-term interest rates from 2004 to 2006 was followed by an increase in the spread. For this reason, in the summer of 2007, the cost of financing on the money market exceeded the medium-term interest rate that the intermediaries could get through securitized assets. The ensuing crisis zeroed the ABCP market, whose value was well over one trillion dollars. The dealers found themselves forced to manage a financial asset portfolio based on mortgages that could no longer be used in the securitization process, and whose value was falling. 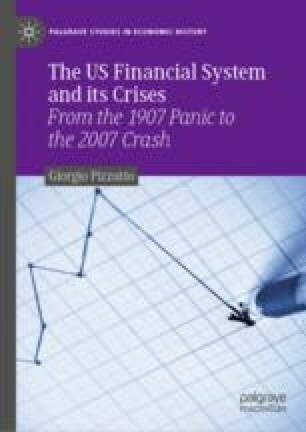 The weakening of their balance sheets had two consequences: first, growing difficulty in obtaining financing on the customary markets (repo and triparty repo); and, second, the withdrawal of collateral and the closure of debts with their traditional clients, hedge funds in particular. Caught in the grip, some, like Lehman Brothers, went bankrupt, and others had to be bailed out by other banks or by the government.